Limkheda gets a "Thumbs Up!" The Adivasi Kumar Chaatraalaya is currently operating from a temporary shelter in the tribal village of Sashta in Gujarat. Sashta is 5 kms away from Limkheda town and 45 kms from Godhara. The 27 students currently at the student home mainly belong to Adivasi families of the Bhil communities from villages in and around Sashta. Bhils are a scheduled tribe with their own leadership, laws and customs. They are a homogenous ancient ethnic group where they face the challenge of living in a hostile environment ravaged by drought and outbreaks of diseases. Poor infrastructure and lack of academic institutions further aggravate their situation. They mainly work as peasant farmers, field laborers, and village watchmen, where often they have to put in eighth to ten hours of hard labor for a mere pittance of Rs. 20 to 25 per day. Educationally, these Adivasis are far behind the national mainstream and have recently started sending their children to school with a lot of reluctance. Being poor and illiterate they have been easy prey to the greedy and exploitative tactics of the rich landlords and moneylenders. The children come from very backward areas, their parents are mostly laborers living below the poverty line. They are of the age group 7 to 12 years, studying in Std. II to VII. They are taught Yoga in addition to academics. This keeps their body fit. They also take part in indoor and outdoor games. This is a Study Room of the Students. We provide them daily tuition by a trained teacher. They attend the “Sandhya Gurukulam “ – evening private tuitions. These students when they joined the Student Home were not even in a position to even count up to 100. But today, they can not only read and write in English , they can speak in English. This is the result of the evening tuitions that are conducted regularly by a dedicated trained teacher. There is a Kitchen and Dinning Hall. Students take lunch and dinner as per our tradition. We provide them food with vitamins, proteins and nutrition. Students do their work by themselves only. They also help in gardening and cleaning the Chaatraalaya. The children are also given special classes in Samskrita Sambhashanam (Conversational Samskrit). Every year they also give Sanskrit exam which is conducted Samskrita Bharati, Delhi. The Chaatraalaya runs under the guidance of Swamini Spashtatmananda, who takes care of students wholeheartedly like a Mother. She was instrumental in visiting all the tribal and backward areas near Sashta and admitting the needy students into the student home. She teaches the children the values of life and gives them samskaras to become a complete human being. Dharwad children on their way to a bright future! Dharwad also known as Dharwar, is in the state of Karnataka. The legendary”Dharwad Peda“, made from milk and khoa, and Babu Singh’s “Thakur peda“ are some of the famous sweets available in this town. Dharwad’s population 648,298 ,as per 2001 census. Dharwad is located 425 Km northwest of Bangalore. The word “ Dharwad ‘ means a place of rest in a long travel or a small habitation. For centuries, Dharwad acted as a gateway between the Malenadu (Western Mountains) and the Bayaluseeme (Plains). The late centenarian Mr.Mangesh Kulkarni , always wanted to help the needy and the blind children. 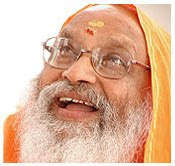 So, when he was unable to cope with the administration of Dayananda Dharma Trust, chaired by Pujiya Swami Dayananda Sarawathi, he handed it over to AIM for Seva to run it. The Chaatraalaya is situated on the Pune – Bengaluru highway. It is on the way to Dharwad from Hubbili. The Chatralaya houses 33 school children and 9 blind college students. Children are provided with healthy nutritious food and highly ventilated dormitory. They are also supplied with all the study materials pertaining to the class they are studying. Special coaching in academics is given in the evenings by noteworthy teachers to these children. Mr. S.M.Anand, the warden takes care of these children with love and care. Kamalapuram gets help from Houston! KAMALAPURAM : This mandal (town) is in the Kadapa district of Andhra Pradesh. Agriculture is the main occupation of the people of this region. The Papaghni and Penna rivers are the main sources for irrigation and drinking water. Historically, this town is connected with Vijayanagara Samrajya that was ruled by Sri Krishnadevaraya. Though the overall literacy of the district stood at 58% (As per the 2001 Census), the status of literacy rate in our programme area is much lower than the district average. Female literacy is even lower with around 30%. Farmers in the area have taken up cultivation of cash crops like cotton and chilli. Returns from these crops in the recent past have not been rewarding and hence the economy of the farming community is experiencing a very difficult situation. In the light of the above, the community had started losing interest in the developmental interventions by any agencies. They never believed that the community development projects, (Chaatraalaya) would aim to address their problem and find out solutions that are people-centric and be a typical one. However, through periodic interactions with the community, they have started to slowly change their perception about the project. The premise on which the Chaatraalaya is built (participatory manner) has gradually brought in confidence within the community. This is very evident from the satisfaction and happiness expressed by the parents. The Chaatraalaya is for boys only and was built by Shri. Dr. Yemmanuri Ramulu, USA, in the year 2007. Children from the neighboring 15 villages stay in this chaatraalaya. This chaatraalaya is supervised efficiently by Sri. 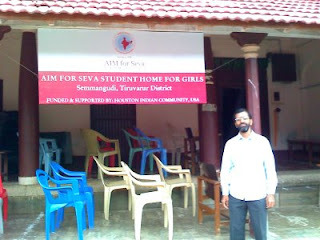 Govindahariji, who is also the trustee of AIM for Seva. For the Academic year 2008-2009, the strength of Student Home is 46 boys studying in classes 1 to 6. Bobbili Gets Maintenance Funds from Houston! Bobbili is a town close to Vizianagaram city in Andhra Pradesh. According to the 2001 census the population of Bobbili is 1,16,205 with an average literacy rate of 64%. There are 75 villages, most of which are tribal areas, which constitute the town of Bobbili. The population is economically poor mainly working as coolies and farmers. This AIM for Seva ChAtrAlaya was constructed in 2006 with donations from the Raghuthu family of USA as Bobbili is their home town. 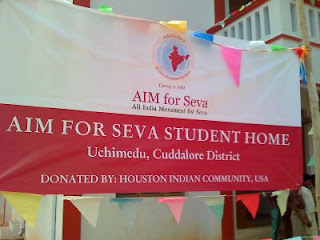 AIM For Seva Houston donors provided for the maintenance of this ChAtrAlaya for the year 2008-09. The 52 boys in the student home are studying in classes 1 to 6. Apart from their academics, the children are encouraged to take part in various extra curricular activities and are also taught yoga, meditation and chapters from the Gita to ensure overall development. The students enthusiastically help maintain a kitchen garden in the premises which grows a variety of vegetables, making the student home self sufficient for its daily needs. Recently, the Rotary Club (Mahila) of Bobbili donated trunkboxes for the children to store their belongings. Mr. Narayanam Narasimha Murthy of NCS Sugars donated sports equipments for the children. The warden Mr. Subba Rao takes a special interest in the progress of the children. Two students from this student home stood first in their class in school in the last academic year. The students have also participated and won in various Gita chanting and poetry reciting competitions held at inter school levels. The solemn function came to an end with the National Anthem. This ChAtrAlaya (student home) has been started in a heritage building which is over 120 years old. The building is a very good example of the traditional architecture of the Kaveri Delta region. The girls mainly belong to the tribal regions of the Anaikatti hills. They attend the Semmangudi Higher Secondary School managed by SDET (Swami Dayananda Educational Tust). This is a girls-only Chatralaya. On the 8th August, girls from the Semmangudi School had assembled to receive Mr. Jayakumar Srinivasan, representative of the Houston Indian Community, Mr. Srinivasan, National coordinator – Projects, Tatvanishta Chaitanyaji, Project Coordinator- North Chennai, and Mr. Venkata Narayanan, Retd. IAS Officer, for the inauguration of the ChAtrAlaya. Mr. Jayakumar was given the honor declaring open the ChAtrAlaya. The guests of honor were then taken on a tour round the ChAtrAlaya. People from the nearby villages had gathered to greet the dignitaries. After the prayer, Mr. G. Ramachandran, Correspondent – SDET, spoke on the uphill tasks faced in the upcoming of the building at Semmangudi. Br. Sinivasan, National coordinator of Projects, spoke next, on the concept of a ChAtrAlaya. He stressed that the student homes form a nucleus around which education, growth, learning and development happens meaningfully in the community. He thanked the Houston Indian Community in funding the running of this ChAtrAlaya. Mr. Jayakumar stressed the importance the students should give to academics. He also expressed his deep sense of appreciation in the noble task carried out by AIM for Seva, in creating an opportunity to share with your larger family of Mankind. Mr. Venkata Narayanan spoke about the importance of seva; students should not forget the seva enjoyed by them, but instead extend it to other fellow human beings in their life. Br. Tatavanishta Chaitanya, spoke on the values of life, which the students have been taught in the ChAtrAlayas; this will carry them a long way in their life in bringing peace and prosperity forever. A representative from the public expressed his gratitude to AIM for Seva for choosing to build a ChAtrAlaya at Semmangudi, enabling the under privileged children in and around Semmangudi to benefit by it. A student representative went on to express the joy that the girls felt to be exposed to education within their reach. On the 9th August, students from the ChAtrAlaya (student home) had assembled to receive Mr. Jayakumar Srinivasan, representative of the Houston Indian Community, Mr. Srinivasan, National coordinator – Projects, Tatvanishta Chaitanyaji , Project Coordinator- North Chennai, Mr. Arunachalam, a leading Lawyer of Cuddalore and community leader, and Mr.Subramanian, Head Master of the School attended by children. Mr. Arunachalam, a leading Lawyer of Cuddalore, formally inaugurated the ChAtrAlaya, along with Mr. Jayakumar. After the prayer, Br. Srinivasan, welcomed the gathering, and about the teething troubles faced in the upcoming of this ChAtrAlaya. He profusely thanked the Houston Indian Community for funding the ChAtrAlaya. He said that the ChAtrAlaya is a home filled with warmth and care set up by AIM for Seva to make education accessible to children in remote areas of India. Mr. Arunachalam in his presidential address reinforced the importance of academics and also that the superior form of charity is VidyA dAnam – imparting education. Mr. Jayakumar pointed out the facilities offered in the ChAtrAlayas must be put to the best use by children; trained and caring wardens fulfill the wards’ social, domestic, and emotional needs and the expectations children have of parents, fostering the growth and their development. Mr. Subramanian, Head Master of the School where the students of the student home go, appreciated the noble work carried out by AIM for Seva in the running of the ChAtrAlayas and the dedication with which the children are taken care.